Fr. 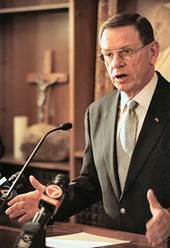 Doyle has worked with victims of abuse and their families, priests accused of abuse, bishops and superiors of religious institutions on this issue. He has received the “Priest of Integrity Award” from Voice of the Faithful and “Red Badge of Courage Award” from SNAP. Free and open to the public. Free will offering will be asked.